Welcome to Day 2 of the Mega March JustRite Blog Hop! Now these are all very nice as is. And that’s the beauty of buying nice pieces already finished — just a little altering to the lids and you have a custom piece ready to give as a gift. Much quicker than purchasing a completely blank alterable. And I like things quick and easy!!! And I LOVED the garden bench when I spotted it — instantly I KNEW it was going to be a pincushion for this project. The first thing I did was to cover the lids, just the very tops. I traced the lid onto my DP, cut it out, glued it on, sanded the edges to get it smooth and blend it in nicely, then I took a small chalk ink pad and applied ink to the edges covering where I sanded. Very little effort and the boxes look as though they came this way, but NOW they are all set to become a custom gift ensemble. Papers I used for this project are by Graphic 45, both LeRomantique and On the Boardwalk. The 2 pads worked together well. Links to all product used are down at the end of my project photos. Now, on to the pincushion – that was fun! To make the pincushion I just cut a piece of chipboard (backing from a DP pack) to the shape of the bench seat, found a scrap of fabric and some polyester fiberfill, and using the fiberfill as stuffing I wrapped the fabric around it, with the chipboard base on the bottom, and hot glued the fabric to the underside of my chipboard base. Then I trimmed it up with a bit of lace before gluing it to my garden bench seat. Here’s a closer look at the focal image. There are so many projects you can come up with using Stitched with Love! Fun set! It requires a 2 3/8″ Round Wood Stamper. I used Copics to color my images for this ensemble. Here I used my Circle Nesties and Heart Nesties. 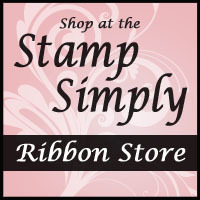 All items used on this project are available in The Stamp Simply Ribbon Store. This is the largest of the oval boxes. It is about 7.5 x 5″ and 3.5″ high. The buttons are sewn on with heavy button thread and all the bows for this project were made of 100% Silk Ribbon by May Arts in Ivory, on the Bow Easy. Here I used my Petite Oval Nesties (4 pack). I can see this box filled with spools of thread in a variety of colors. It’s plenty large to hold a goodly amount! 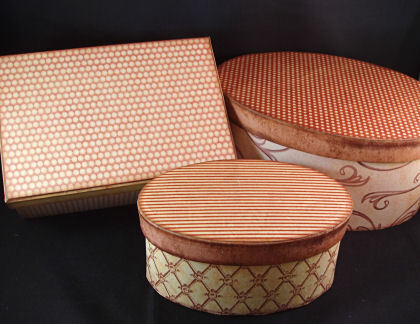 This is the smaller of the oval boxes, measuring 5.5 x 3.5″ and 2.5″ high. Again, here I used heavy button thread, the Bow Easy, and circle dies and oval dies from my 4 packs of Petitie Circle Nesties and Petite Oval Nesties. All images on this project are stamped with Memento Tuxedo Black Ink and Copic Colored. All sentiments are stamped with my favorite, crisp black ink, which is Versa Fine Onyx Black Ink. 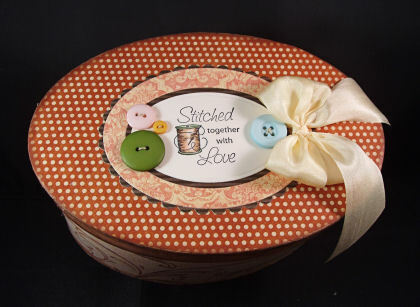 This box is intended for buttons — oh how fun to fill it to the brim with vintage buttons! This is the rectangular box, measuring 6.5 x 4.5″ and 3″ high. Again, the same product details as the oval boxes, but here I used my Classic Rectangle Nesties for the base as well as my Petite Circle Nesties (all 4 packs, which IMO is the best way to purchase them). 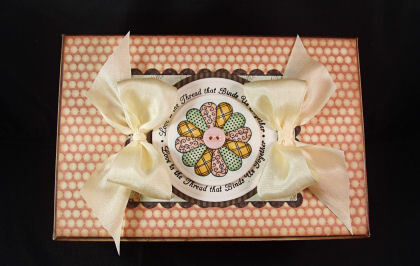 This box would be fun to fill with ribbon, lace and twill — items held very dear to a crafter! Aside from the alterables which came from Michaels, all items used to make this project are available at The Stamp Simply Ribbon Store. Click here to see the Ribbon used as well as all ribbons which are 10% off BY THE SPOOL through 3/31. Click here to see the JustRite Stamps, paper pads sold individually, ink and other supplies. All JustRite Products are 10% off through 3/31. Click here to see the Bow Easy and all the Spellbinders Nestability Dies used on today’s project as well as many more. Click here to see these Graphic 45 papers sold in KIT form, along with other KITS as well. Thank you so much for joining us today! Your visits are what make it so FUN!!! Thanks much and see you real soon! The weekly Stamp Simply Challenge will be posted late Thursday night, as usual. The Stamp Simply Ribbon Store is pleased to offer ALL RIBBON BY THE SPOOL and ALL JUSTRITE PRODUCT IN STOCK at 10% off through 3/31. This sale applies to ribbon by the spool only, not cut yardage, and Just Rite product in stock. All prices listed in the store are FULL PRICE. 10% will be taken off when you are invoiced. To order your May Arts ribbon, JustRite stamps and other supplies, Tools or Kits, just email me at ssj@up.net. Oh my gosh Sharon, this is over-the-top adorable! What a perfect gift ensemble for a special friend that loves to sew!! She’ll treasure it! Love how you altered the oval boxes (my favorite shape), and that pin cushion is fabulous, I’ve got to find that bench . . . I want one for my craft room, it’ll be perfect! You’re giving me some ideas here . . . I have some boxes I bought at T.J. Maxx that are perfect for altering . . . thanks so much for sharing your creativity (and enabling me . . . LOL)! Absolutely adorable! That would be a great gift. Sharon this was totally worth you staying up half the night to showcase! WOW is it a gorgeous set! What brillant ideas! So sweet! I love your projects. Great happy colors and details!! They’re all truly fabulous! absolutely adorable!! These are just a great little gift set! Sharon this gift ensemble is undoubtedly the most precious thing I have seen using these JustRite images. Very cute ideas. The total project is just stunning. OMG!!!! These are incredibly GORGEOUS…soooo very creative, that bench with the pillow takes it all..LOVE IT!!! What a fabulous gift idea. That pin cushion is the cutest. I always love your creations. I will have to run out now and get some inexpensive boxes like this to alter! Well done! Your giftables are just awesome and your photos of them are outstanding. I think that is such a great stamping set and love to see all your creative ideas. They are adorable. Very cute ideas & love your choice of colors. Thanks for sharing. What an awesome idea! I can’t imagine anyone who wouldn’t love to get that set or even just one of them! This set is absolutely GORGEOUS!!! And that pin cushion is adorable!!!!! You are so creative! Love your projects. The pincushion idea and matching stamps are adorable. GREAT PROJECTS. JOB WELL DONE. Beautiful and inspiring projects as always my dear! I love each and every one of them. Absolutely adorable! I am drooling I want these! OMG…you’ve been busy! Love these and who doesn’t love a sale!!! They are all just gorgeous! TFS! GREAT PROJECT IDEAS. JOB WELL DONE. Wonderful projects and gifts for a sewer (that would be me…want my address…LOL)…..beautiful!! These are so great! I think this is my favorite stamp set. I go to Michael’s all the time, and never thought about re-creating something. Thanks for the directions too! Love the project, especially the pin cushion. Thanks for sharing. Such a creative project, and I really love that pincushion! Thank you for sharing your creativity. Love those projects! How fun! So glad you got your post up — I would have been sad to miss these gorgeous creations! Such a creative and beautiful pin cusion! I’m in love with these! They are so beautiful! This set is just WONDERFUL…all that hard work shows! That pincushion – OMGosh! LOVE it!!! I am in love with the bench pin cushion! Well I love everything, but the pin cushion is just so different and adorable. You have outdone yourself – awesome work! What a great set! You do such a wonderful job with everything you create! I nearly pee’d my pants when I saw this, Sharon! Oh My Word!! My brain is still searching for the words that express high praise for this amazing display! You, my friend, are the QUEEN! I bow! Sharon, I am always amazed and inspired by your designs. They always just gorgeous!!! You have the most amzing creative mind. Wow..over the top absolutely adorable! Absolutely beautiful projects. I have some of these boxes laying around. Now I want to play with them and see what I can come up with. Just adorable Sharon! Love these colors, papers and your entire design! This is soooo stinkin’ adorable. GREAT JOB!!! Sharon, What wonderful little boxes and the chair woo hoo. I love this stamp set Stitched with love! Your work is always the greatest. So I am off to purchase my goodies to make this set. Have a great day! Love the sewing theme so cute! This set is priceless. What a super idea. Now that is one gorgeous set! Beautiful display of your work of art! Very cute projects and thank you for the detailed instructions! I love this stunning set but my favorite has to be the bench. Love your pincushion. I just really like how you keep things simple but they do not lack in beauty! You are very inspirational. You are so creative. Outstanding work! Love them all. Your little pincushion bench just makes me do the happy dance!!!! Your gift set is unbelievable. Anyone would be honored to receive this gift. Thanks for the inspiration. Love these, great little pin cushion bench!. TFS. Fabulous project. Just love the pin cushion! OMG.. Can I come to your house to stamp..:), these are stunning. Your ensemble is fabulous. I am so inspired to do this project. So creative and pretty. Thanks for the inspiration. Just beautiful! I love that set of stamps! I love your ensemble! I especially love the garden bench pincushion. My mother is a seamstress extraordinaire and this would make a perfect gift for her!So sweet! thanks so much for sharing! Adorable set!! LOVE! LOVE! LOVE the pin cushion!! How unique. I just love your ideas! This is such a beautiful and creative project. Love it. I absolutely love that pin cushion bench. Stroke of genius there. I absolutely love this set–you are so creative! Your stuff is always so great! I check in at least a couple times a week… beautiful! so cute – That pin cushion is adorable and the boxes are perfect!! WOW!!! I love the whole set!! The colors are beautiful and the pin cushion has my wheels turning!!! Thank you so much for sharing your awesome creativity!! What a darling bevy of gifts for friends who sew!!! Oh my goodness — simply amazing!!! These are all so wonderful, Sharon! I especially love the pincushion — so cute and clever!! 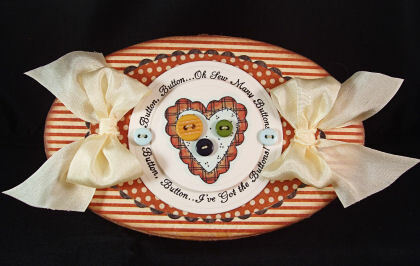 The pin cushion is so adorable and would make an “anytime” gift! Thanks for the cleaver ideas. Absolutely gorgeous!!! I love it!! Thanks for the ideas and inspiration!! LOVE these creations…the colors, the details, everything! Oh My! The chair is sooo sooo sooo cute!!!! This is over-the-top. I love it. The pin cushion may be my favorite project so far…thanks for using that creative mind of your to inspire us. HOLY COW!!!! This is a spectacular project!!! The pin cushion is adorable! You knocked this right out of the park!!!!! I am RUNNING to Michaels. That pincusion is just adorable. I want to make one for my quilting friend. Thanks for the inspiration! I don’t think anyone shows off the versatility of these stamps the way you do, Sharon. This whole set is just amazing! Thanks for sharing the ideas with us. Great project and the pin cushion…. Awesome idea. Loved it. It turned out sooo neat. Lovely gifts! Thanks for the fantastic tutorial. Loving the quilting set. Your projects are great!!! MERCI!!! Such a great gift set. I am very impressed! I’m just blown away by all this creativity! Gorgeous work! I love how with a little color you made these items your own! Wonderful set!! Very cute! I love the pin cushion. Oh My Gosh! What a great idea to use already decorated boxes and just change out a few things. Man, this means I would get more done. LOL! Also love the use of the chair. So creative. Im coming back for this idea for sure. Thanks so much. What a great project! and everything matches! Thanks for the opportunity to win some candy! Cute, cute boxes! I LOVE them. I totally love boxes, and yours are just wonderful! what a stunning collection! A wonderful gift! That little pin cushion chair just made me smile out loud. And the other “altered” creations are super cute as well. Thanks for sharing these fabulous ideas with us! I have to get that chair, what a pin cushion!!!! This is great! Fantastic project and a great gift! I have to see if my lss has that Graphic 45 paper. Darling little gift set. What a clever idea and love it. Thanks for sharing. Great projects and very clever to make a pincushion out of the bench! Absolutely fabulous, as usual! You do such wonderful altered projects, Sharon. And there’s not even any sewing on the pincushion. Great idea. What an incredible set. I love it, especially the color scheme. Your work is always so inventive & inspiring! thanks! WOW!!! i’m impressed! great job on all the projects you are so talented!! Love, love, love this fun project! Wow!!! I love all of your projects, but I’m especially drawn to the large oval box. Great use of the stamps along with the colors you chose. Incredible and so creative ! so cute – I just love everything you create! These are darling. I love matching sets. You’ve done a marvelous job! Sharon, I absolutely love this ensemble. I am especially fond of the chair pin cushion. So sweet! I also can’t keep my hands off of this “Stitched with Love” set. It is great! Hopefully they will make more sewing sets. God bless! Sharon, you never disappoint with your projects. This set is so adorable. I love the bows too. What a beautiful set. Just amazing. OK, I’ll admit it, I have a special fondness for this pincushion idea… what a really great gift this would make for the sewer in your life (or the pin litterer in mine!) TFS! Wow, what a great set. TFS. what beautiful gifts for my friends birthday. thanks for your ideas. Wish I was the friend getting this cute set. Love how you altered the boxes! You’re right…much faster and easier if the piece already has some elements that you can keep but yet still offers the chance to alter it for a personal gift. Love the pincushion too! OMG! these are all so cute! Very creative use of the little bench! Love the whole set. Georgous work. Beautifull boxes. Thank you for sharing your talent. that pin cushion is too cute! great projects! Thank you for sharing this beautiful gift set! What a great selection of colors and papers, and a cute idea! Take care! I can hardly believe what you did. So right, so perfect. Thanks so much for once again sharing your talent. My, oh my!! Such creative ideas you all come up with. TFS! these are so simple, I think I could do them too. WOW! Beautiful projects, I love these stamps! As usual your talent is amazing. I love everything you do. Have a wonderful day and thank you for your inspiration. Love the pin cushion! You did a super job of “repurposing these adorable boxes. Beautiful projects. I would be honored to recieve any of them. Great gifts. When I make something I like to set it on my desk just to admire it for awhile. Awesome projects!! I ♥ the way you used this set. Thanks for sharing!! Beautiful. I love the bench – that’s my favorite! Love that bench!! This is beautiful! I bow to you!!! Your talent for doing paper crafts etc; is outstanding!! Love the total group!!! Great colors, great paper, GREAT idea!!! You simply ROCK!!!! Oohhh…wat zijn dit geweldig mooie projecten allemaal. Echt origineel!!! Excellent samples, I totally love the bench pincushion. Also great inspiration to alter a box for a seamstress to put thread in. Love how you combined the Graphic 45 lines. I’ve enjoyed this very much. These are so cute! What a great gift idea! WOW! These are really great projects! I love them all. Nice work. Thanks for sharing. This is an absolutely perfect ensemble for this stamp set. Wonderful projects – this set is on its way to my house! Sharon: You never cease to amaze me with your lovely pieces of art. Beautiful!! Very adorable! I love the pin cushion and the cushion for the chair…so clever! Beautiful! The first thought I had for this set was what a wonderful and heartwarming surprise it would be for any kids moving away from home for school to unpack this wonderful set. I love your projects. They are so cozy and country looking. I love altered projects and the pin cushion is so adorable! I love this set! Turning the bench into a pin cushion and adding the heart on the back is inspired! You guys and your ensambles today are absolutely over the top beautiful! I totally love this set, colors, theme, etc., I love it all! Thanks so much for sharing and inspiring! Oh Sharon I love this set!! The Stitched with Love set is so versatile ! That pin cushion garden bench is the cutest thing! What a fantastic idea. The whole gift ensemble is adorable. Well done! This is such an adorable gift set. What a fun project to make and gift to receive. Thanks for sharing. I LOVE your boxes. And the color combos are amazing! You have really showcased the “Stitched with Love” set in your amazing creations! I know that anyone would be delighted to receive any one of these gifts! You are so creative! Thank you for your continued inspiration! I love visiting your blog! I love the pin cushion. That would make an excellent gift. Your work never ceases to amaze me. I love your altered boxes, and the little heart attached to the sweet little chair pin cushion is so cute! Love all your projects. They are all gorgeous. Ohhhh WOW!! Okay…I need to go shopping. ….Pretty garden bench, JustRite stamp set, …. inspiration overload, LOL!!! Such a darling pin cushion! Very clever use of the stamp set to create a wonderful Mother’s Day gift. Oh,so very pretty. I love the adorable boxes. Oh, my word! These are SO amazing! Sharon I visit your blog regularly and as usual you have a great idea to share with us! The whole ensemble is great! Your boxes are so beautiful! I love how you distressed them too! Sharon, you rock, girl. All the projects are so vintage and gorgeous. they ‘just’ took my breathe away. and you made it sound so easy. great projects thanks for sharing. I love the use of ribbon and buttons. I’m a button girl myself. So cute! I love this project. It is so country chic! These items were originally nice, but ho-hum. You have made them absolutely stunning! What neat ideas! Oh my goodness…How I love that little bench pin cushion!!!!! Beautiful work. Sharon, this is so cute. I love it. What a great idea. I love this ensemble! My favorite has to be the bench! How fun – love the buttons and bows! Clever ideas for this stamp set. Wow, you were a busy girl too! Tanks for sharing these awesome projects. Sew clever, I love it!! What a lovely gift idea. Thank you for sharing. Absolutely adorable! That would be a great gift for a person who sews. I might have to make some for myself. just a little bit of “totally amazing”….LOVE your set! Awesome idea! What a wonderful gift idea, love it! Must say the boxes are my favorites, but all are so cute! Sweet set! Love the aged color feel and your bows are perfect! I love this set and you have made several wonderful projects. Thanks for sharing. These are great gift ideas. Lovely projects. I love this stamp set and your are wonderful. Thanks for sharing. I don’t know what happened to the above post, it has someone else’s name and email address. Wow, Wow, Wow, so creative! You’ve got great ideas! Colors are all very beautiful schemes! Beautiful JustRite stamps en spellbinders! Love your color combo…so rich! REally cute stuff. Love that stamp set and that little pin cushion is precious. Oh this has to be THE most adorable little gift set! I love it Sharon! Marvelous! 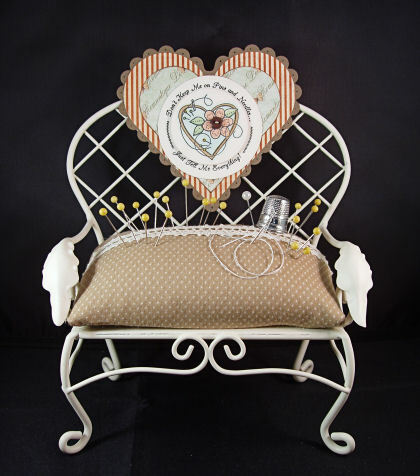 I love to see alter pieces – love the pin cushion idea with the sentiment on the of the chair – to cute! What an absolutely gorgeous gift for some very fortunate person. Beautiful job and beautiful presentation of your gift. Amazing!!! Awesome job on these projects. A perfect gift set for that someone that loves to sew. You did a beautiful job on these projects. Such creative designs! They are so all pretty! Really darling projects! Lovely mix of papers and colors! oh my goodness, what great ideas….just awesome. tfs. These are all adorable! TFS. My goodness but this is an adorable set!! So perfect for a sewer. That bench is over the top cute being used as a pincushion!! Very creative. TFS!! This is an adorable set, I love the pin cushion, I dont have a mother, but I know someone who would love to receive….TF creating such a lovely gift set for us to drool over!! What a fabulous gift ensemble! That pincushion is the cutest I’ve ever seen – what a great idea! It’s kind of rustic almost. Really adorable! Good inspirational pieces. Love the little pin cushion….how clever is that? Lovely set! It’s really adorable! Wow! The recipient of this gift set is going to be very blessed indeed. ALL of the pieces are so lovely! Love all your projects! They are all so beautiful! Very nice work! Thanks for sharing and LOVE YOUR BLOG! This is the cutest gift set I’ve ever seen. I knew I would see lovely bows here & you did not disappoint! I love your altered items. TFS! What an amazing collection of altered items!! I love the Graphic 45 paper for this project!! Just stunning… all of it!! Great job, these are so cute. They would make great gifts. What beautiful eye candy Sharon! Love all your projects! Beautiful collection. Looks like something you would find in an boutique. What a wonderful set and the pincusion is fab! Whoever gets this set will be thrilled! Absolutely loved your Gift Ensemble! The bows are perfect and really accentuate the projects! Wowee , I just got some of these at local michaels as well! Thank you SO much for the inspiration and sharing your amazing designs! WOW! Brilliant projects! Amazing artwork, creativity & inspiration! WOW. How creative and pretty!! Wonderful projects!! Especially love the pin cushion chair!! Thanks!! Gorgeous pieces! That stamp set works so well with your idea. your projects are very impressive. WOW! Oh my these are amazing. I don’t even know if I can pick a favorite. The pincusion chair is totally cute though. Uh oh- I feel a trip to Michael’s coming on……. love this project! You are just too creative for words! those are some amazing projects. Good job! Love the gift ideas! Sharon, you just make the greatest projects! Of course that pin cushion is divine, who wouldn’t want that sitting on the sewing table? And converting the boxes was wonderful, and of course your stamped and die cut decorations on top were gorgeous! I’m glad we don’t have to pick a favorite! All your projects are So Cute! Thanks for sharing. Very cute projects. You did a great job and would make a good gift. Thanks for sharing. Oh I ADORE these. Love the light colors and the button accents! Ok this is just over the top adorable, WHERE does all of this talent come from? Love your sewing emsemble!! Great idea!! Thanks for sharing!! That pin cushion is adorable. Must remember that project!!! Oh Sharon ~ Your imagination never ceases to amaze me!!! What a fun, great, beautiful project…and as a gift any woman would love! You are the Top of the Trees!!! Oh my goodness – what great projects. I just love them. absolutely love the pin cushion idea! oh, so cute. Great projects. Love the colors you used! Very creative gift ensemble! Any woman would love to receive this. I have to have that chair pincushion. That is the most cutest thing I’ve seen! You always create the most amazing things. I am in awe of your talent. Wow! What great projects! I love ’em all. Very beautiful. Your projects are always so elegant. TFS. Oh my! Buttons, bows and muted colors – how gorgeous…..! Your are the BEST – I am so in love with the pin cushion! Wow what a nice job. I sew… I could and would make very good use of this set!!! How pretty are these projects! Thanks for sharing! Amazing! I love them! Fabulous Boxes! Thanks. What a great set of gifts. 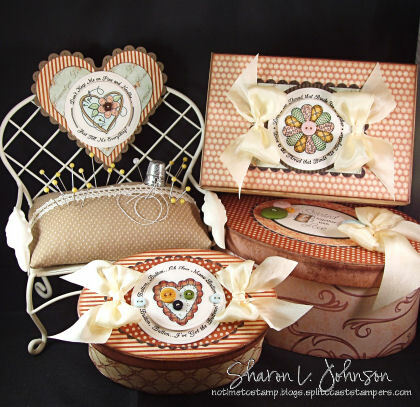 Wowzers Sharon this is one elegant gift set – love how you showcased these fab stamps. Thanks for the gorgeous inspiration. Great work! I like that style with the dusty rose. This is stunning.OMGosh.I’m buying boxes now. The bench seat pincushion is such a fun idea! Looks great too! Very creative and beautiful projects! Sharon, you’re totally amazing. This takes top billing on my “must do” list. Sharon this is just simply adorable great ideas!!!! what a cute set! I would like to have one of these! I love all of these. The garden bench made into a pen cushion is so creative. And all the boxes are beautiful. You’ve inspired me to think more out of the box. What a great set. It would easily fit into anyone’s sewing room as functional accent pieces. I love to see how people put things together like this to make a gift set. Thanks for sharing your creativity. Another wonderful project from Sharon. I love your style. Your projects are wonderful. I love each of them and they would be perfect for my seamstress aunt. Thanks so much for the idea! Love your projects and follow your blog! This is sooo cute, what a great idea Sharon! Such a beautiful set! And, you make it look so effortless! What a great ensemble! Inspires me to gather things to alter for a set for my craft room and gifts to others. Thank you for sharing. All is so pretty, but LOVE the pincushion! I always enjoy your creativity. This idea is sew clever! Love that pincushion! Great projects and so pretty! Sharon…I don’t think that these little sets could be any more adorable!!! Love them and the way the ribbon drapes so elegantly. Another Stitched Together with Love project!! Yippee!! I love these stamps!!! The pin cushion is just the MOST ADORABLE pin cushion I have seen. I LOVE your ideas! Sharon as soon as I saw that you were posting something for this blog I knew it was going to be fantastic!! You have truly outdone yourself this time. Thank you so much for the inspiration! How very clever! A great gift set! TFS! OMG!!! This set is so adorable. I just love everything. You incorporated so much detail and creativity. I really appreciate all of your inspiration and hard work! Such a wonderful homey feel to your projects. All are very nice. The colors are so beautiful together, and you have a way with bows like nobody else! Thanks for sharing! Absolutely darling project and the pincushion is the cutest! Wonderful! These are so pretty! I’ve thought of recovering boxes and journals like this, but always felt kind of guilty. Now I won’t, because yours are so much better than the original! Oh my goodness, how clever and beautiful. Thank you. What a great project…very clever. Thanks for sharing! This is a great gift set. Love your pin cushion. YOU BLOW ME AWAY!!! Absolutely gorgeous projects. As always I’m inspired by you. I love altered items and especially these which are flawlessly crafted! That pin cushion is irresistable! I like to try to alter things, but I am nowhere as crafty or talented as you! Great job. That pincushion is fabulous! 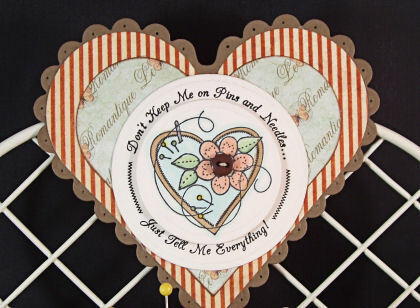 Very pretty set, love the bows and the sentiments are great! Love your gift ensemble! Stitched with Love is such a great stamp set, and you’ve showcased it to perfection. Wonderful projects! Love the set! OK, it’s official! I am truly envious of your creativity!! On the other hand, I am tickled pink that your share! I visit your blog several times a week and have loved every project! great idea ……. love how u decorated everything. So many details. Very cute, love the colors! Thanks for the chance to win! and Spellbinder dies. I love the way you “altered” each item. What a wonder gift(s) this will make! Thank You. Sharon, as usual you have really out done yourself. What talents – to spot such potential in these items and then go home and actually do it so beautifully! (My favorite is the pin cushion.) Thanks for sharing. i love this set, so stunning! What a lovely gift ensemble! Anybody would be proud to receive this as a gift. Awesome job! AMAZING… I think that pretty much sums it up!! Oh Sharon – I always love to see your projects and you have done it again! This sewing ensemble is gorgeous. I love the pin cushion bench – how creative! And those perfect bows, the buttons…………wow. Really a gorgeous set Sharon – totally love it. Wow, such a beautiful set. WOW! What wonderful things! I love the idea of sets! What great inspiration! Very fun hop and lovely projects! Beautiful! Being a quilter I especially love your designs! How very creative you are. I love what you have done with this set of stamps. Can we say ABSOLUTELY ADORABLE!! Sew very SWEET. Love how you did everything. I would not change a thing. Thank you for sharing. What a wonderful set. You’re so creative!!! OMG those are just way too cute! Just adorable, love the pin cushion! Adorable. Love your projects, color choices. The heart is my favorite. You are so talented thanks for sharing. You were thinking ‘out of the box’ with these creations! ðŸ™‚ Very nice…all! One of my most favorite things to see is an altered project and yours are fabulous – especially the pin cushion bench. Michael’s is an inexpensive place to find objects to alter. You did a fantastic job. Great colors. This is fun looking at all the creativity. Simply adorable these are great projects. What an AMAZING set of projects! I am so impressed with your creativity! Awesome project – I have never seen such beautiful work as I go along on this blog hop. Love the pincushion! Actually … love all the projects! TFS! I just absolutely love these. So very, very nice. These are awesome!!! I love your pincushion garden bench – genius!!! What an absolutely adorable set!! LOVE these “sew” much!!! WOW what a great gift set!!! Just Fabulous!!! what an AMAZING gift set!! truly Superb! Yes, I have to check out that bench at Michaels. You made it look so very cute. Sharon your projects are always so together and perfect. beautiful gifts and i am loving these stamps more and more, see them in my future! So sweet, all of them. These sets are so cute!! You are so right, they would be perfect for Mother’s Day!! I I just have to say it again, Cute, cute, cute!!! Such a darling set. Great job. Very very creative!! a pincushion… I can’t believe it… I’m in love with this hop too… Thanks for the chance. Wow! What creativity! Very cool projects and love the colors! I may never look at things the same, now I’ll be more – what can I do with that, in a crafty way! Thanks for the wonderful ideas! I love that chair. Makes such a cute pin cushion! Sharon, You constantly amaze me. Even I would use that pincushion! What fun! I like the idea of using nicely finished items. Covering rounded sides is much more difficult than covering the tops—-I’m going to quit trying to reinvent the wheel and just cover those tops from now on. I’m really loving the ribbons that everyone is using from your store. They are beautiful. Oh my, my. Those altered boxes are to die for! Great job on your project!!! Sharon, this set is so darling! What a great project or projects I should say!! Cute and very vintage! Love it! I am constantly amazed at the creativity I find on these hops. This set is just gorgeous. What a lovely gift set. Great work! I LOVE LOVE LOVE this project!! Once again Sharon, you have created the most awesome, elegant projects!!! These are stunning!! Perfect set for new seamstress! how creative!!! that little pin cushion bench is a marvelous idea!!! thanks for sharing!! love your ideas- thanks for giving me inspiration to look at other things in a different way- that pin cushion so sweet and the boxes- I would love to recieve them all especially if they were filled with your suggestions especially the button box- I love buttons-especially old or vintage ones. What a cute idea! Lovely…. Fantastic projects and they all look stunning. Stunning creations as usual! I especially LOVE the garden bench pin cushion…amazing! I love it!!!! I never even thought of buying something like that and then only covering the lid! What a great idea!!! Thanks so much for sharing you talent. Loved the pin cushion and the boxes, I am sure whomever you give it to will love them all! what really cute projects. love that bench. What a perfect set as a gift for someone who loves to sew. Love the pincushion in the chair absolutely darling. Wow, Sharon! These are fabulous! Love your colors and use of this set! Lovely projects and great inspiration. This is an amazing set! You did an awesome job on it. what beautiful transformed pieces! Love the pin cushion! The pin cushion and the colors are great. Thanks for this awesome idea. All of these pieces look amazing. Love the colours and the stamp images! What a beautiful gift set. Possibly for Mother’s Day? Thank you for the inspiration. Oh my goodness – so much goodness in one blog! The little bench seat is adorable. I love the Victorian look! Awesome work! What a fabulous project! I’m not a seamstress, but a pincushion like that is exactly what I would want if I were! All of your projects are so gorgeous, thanks so much for sharing your amazing talent and caring spirit!!! Wow, What a great gift set this makes. VERY, VERY cute!! Great ideas for altering store bought items. Thanks for sharing! Nice homespun look in both the images and the colors used. Sharon this is so beautiful and creative. What a great gift idea. What a cute gift set for the crafty lady! What a perfect set!! This little box could be used for dozens of great hiding things!! Could be a great sewing kit for a new home especially a guy who NEVER has thread or needles. I really do love this!! These are all so cute I love them. LOVE these projects – amazing! Wow that bench is so cute and what beautiful boxes!!! So cute – love your projects!! Beautiful and what wonderful gift ideas! This are fabulous! I just love each project! How very clever you are to see a different use for a purchased product. These are all just lovely and would certainly make someone happy to receive them as a gift. I especially love your choice of colors. What a beautiful gift!! That darling bench makes me wish I sewed!! Absolutely gorgeous creations! You are just amazing. Everything you make is SO beautiful!!! Really, really cute – love the pin cushion! These are all beautiful. You have such talent! I hope my comment doesn’t dissappear like the one before mine did by Theresa. My first comment dissappeared when I posted my second one. something wierd is going on. The projects are fabulous! The pin cushion idea is pure genius, and you do tie bows divinely! what a great vintage collection you have created. Great projects. My favorite is the pin cushion!!! Your entire set is beautiful, but that pin cushion – that’s is some WOWW! These projects are so pretty. Love, love, love your pin cushion. Too darn creative. I love your project!Thanks for sharing! WOW… you really went way out! I love that you are going green! And what a great idea with the little bench! Thank you for sharing! Your projects are just beautiful! These are lovely projects- I think my favourite is the pin cushion seat. I like the colour combinations you have used. OOhhh – I love the vintage look of these – just luscious! Great Job! Oooo & AHHhhh! So cute!! Love these projects! What a cute set; thanks! super adorable!!! love the colours you chose and the ensemble you created! lovely! I love your project! Thank you for a chance to win! It’s so fun to see what everyone has done. Your project is so cute. Just perfect! WOW, Everything is beautiful but the pin cushion is adorable. I want one!! Hi Sharon!!! As usual you did a fabulous job. I learned about the Just Rite blog hop through your blog so TYTYTY. Hope I win something because I have long admired them through your blog. TFS!!! these are beautiful! I love the bench as a pin cushion. Wow! Those are great! Thanks so much for sharing your great ideas! Oh wow, what fabulous projects! A wonderful gift set, but I especially love your little pin cushion! How beautiful! My friends would love to receive these as gifts. Oh so pretty and Oh so perfect! How creative! Oh my you realy out did yourself I luv the pincushion just amazing ur talent!!!! These are so beautiful! I have a bunch of boxes that need covering, now I have all new inspiration – TFS! Oh my gosh, your project is “sew” cute!!!!! Your creativity absolutely amazed me! That pincushion bench is ADORABLE!! I’m so running out to Michaels tonight after I finish my experiments ðŸ™‚ Love the entire ensemble though, very homey color scheme. LOVE, LOVE, LOVE your project and creativity! What a great idea. LOVE your projects! Thank you for sharing! This is such a cute and imaginative project. Don’t you just love altering and repurposing items? It’s a great exercise in out-of-the-box thinking. Now these are just too stinkin’ cute. I love the altering you made on the lids. And that little sewing seat is too cute. Very vintage. I like it a lot. Oh my goodness, what a fabulous project. You sure did put a lot of love into this! I love your project. I will be back to learn some more. What a fabulous set of boxes! I love how you altered the boxes and turned that chair into a pin cushion!! That’s so creative. Love it! TFS such awesome inspiration. Sharon you out did yourself with these projects. Beautiful work. What an absolutely beautiful set. I’m loving your creativity! Thanks for sharing. That is a beautiful project! Love this set!! These are beautiful. The creativity amazes me! I just ADORE the things you created with my favorite stamp set, “Stitched With Love” !!!!! I love reading your blog and seeing your gorgeous creations. Right now I’m in awe of you being able to look at a garden bench plant stand and see a beautiful pin cushion-in-the-making! Wow! Beautiful…what a lovely gift to recieve. Oh my goodness, you have throughly convinced me that I need this set. You have created such wonderful things with it. That pin cushion chair is to die for. Thanks so much for the blog hop. I have been so inspired. OH MY!! I LOVE that pin cushion idea!! SO cute! TFS! Get job! Love your set. Thanks Sharon for sharing this lovely projects! What a fabulous idea for this set….love that little pin cushion! What a great set. I appreciate how you work with the original design of the box rather than starting with a blank canvas. You’ve offered an option that takes less time, but is still a custom creation – the best of both worlds. Love all your project. So much inspiration going around in this blog hop. This is all beautiful! What an awesome crafty gift! Great projects. The pincushion is my favorite. Thanks for sharing. What cute gift ideas. They will make great gift boxes. I love the pin cushion but everything is gorgeous! What a great gift set for a lucky friend! 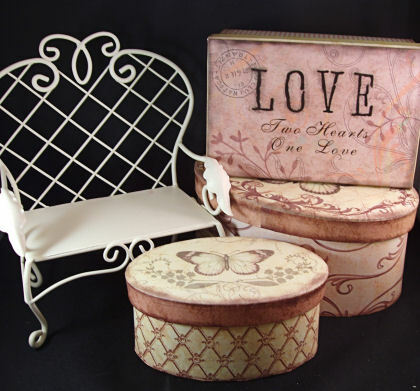 That stamp set is really adorable & I just love the pincushion bench! I love this set…it’s perfect for (well) me! I especially love the way the boxes match! Thank you! Those keepake boxes are amazing! I hope you sell them! Absolutely stunning! I LOVE your little pincushion, it’s gorgeous!! Sharon, what a wonderful gift set! Your creations always amaze me!!! Such cute projects! I love this stamp set! This would make such a cute gift for a sewer…just love it! These are spectacular! You did a fantastic job on these. I may have just found another blog to subscribe to! Cute ,Super cute!! Love the Pin cushion..the color combo is Awesome!! Beautiful creations! I love it. I have quilters in my family; this stamp set would work beautifully. Great work–all the pieces are lovely! What a perfectly cute little set. love how you altered the items using the products. love the pincushion bench. This is outstanding. Bye far one of my favorites. I know there are amazing ladies here with loads of talent, but this jumped out at me instantly. I think it is the combination of papers and your amazing coloring skills, also the country feel it brings. Thanks so much for sharing. Love the vintage feel of your work! Encourages me to go ahead & try soem of my own! Thank you so much for sharing your talent! OMG! You ladies with such talent to take something so ordinary, simple and “boring?” and turn it into something so amazing and beautiful! Thanks for sharing your wonderful talent! The boxes are sooo great! LOVE them! Awesome work! And the bench… want one! Love this set … would be wonderful for some sewers in my life. What charming boxes! Love them! Awesome project! Love the pincushion idea! The stamp set it awesome! Oh my goodness. Sharon, you rocked this blog hop! I LOVE your altered projects. What beautiful projects you have created! Love all your colors! I don’t own any of these stamps yet! I can tell you that I would like every one of them! Sharon, my friend! This is simply breathtaking. I love it all. Perfect set for a sewer like myself. I love to sew as much as create paper products and your designs here are just stunning – super cute and very inspiring.